Want to record that impromptu 'unplugged' acoustic jam with a minimum of fuss and trailing cables? Line 6 reckons it's cracked the problem with a new audio interface that's also a pro-grade microphone rig. 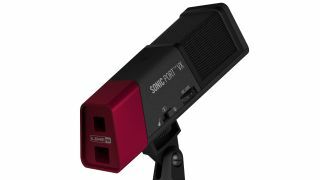 The Sonic Port VX boasts a trio of built-in condenser microphones - a stereo matched pair and a front-facing mono mic - as well as a conventional 1/4-inch (6.35mm) instrument cable input. It can be mounted on a stand to capture acoustic instruments or vocals like a conventional mic, or used on a desktop as a conventional interface for electric guitar or other plugged-in instruments. It features 1/4-inch (6.35mm) stereo outputs, plus a 1/8-inch (2.5mm) headphone output, and is compatible with Mac, PC or iOS devices and associated apps, including GarageBand and Line 6's own Mobile POD app for guitarists, which feature's 10,000 amp and effects modelling presets. The Sonic Port VX will retail for £139.95 in the UK. Visit line6.com for more.